quinn wrote: I suppose it could be possible that they're overweight - however I generally keep a close eye on their diet and have weighed them if they seemed particularly big or small to be certain whether this is the case. I certainly don't want it to come off like Im pro feeding rats to be fat, BUT I have to say I've never noticed my fat rats live shorter lives than the 'normal' ones. I've had several fat rats over the years, and all of them have lived at least to average age, if not beyond. 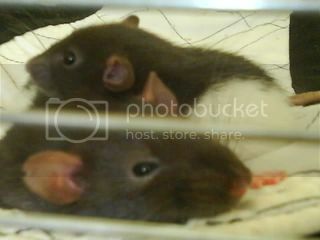 In fact, I may even go out on a limb and say my chubbier rats live longer, on average. Obviously as the vast majority of my rats at any time are rescues, my life span reports at probably not good examples, as all my rats would have hailed from pet shops or BYBs originally, and not reputable breeders. I only have 4 breeder rats. But regarding weight, I do prefer my rats to be overweight than underweight. When rats get ill, they drop weight so incredibly fast that I like mine to have extra weight on them to better cope with this when/if it happens. Obviously, there is a line to draw; if a rat was the shape of a beachball and couldn't get around or live a normal life due to their size, thats a bad thing. Its like with people; if someone is only a couple of stone overweight, its probably not going to affect them too much. If someone is 400lbs overweight, thats serious. But having reasonably overweight rats isn't a problem, to me, and I've never noticed it affects their life span. My oldest rat to my knowlege (again, with mine being rescues, Im never 100% sure how old they are unless I get them as tiny babies, which is rare) was Lenny. I did have him for a baby, so I could be pretty confident on his age. He was the last rat people would expect to live to be old: he was hairless (considered to be less healthy in general) and a rescue from a very cruddy situation. Both his brothers died young, one from suspected cushings and the other suddenly from an abscess. And not even a 'serious' abscess either. His back legs went when he got old, and while he was a fatty in his youth, he became bony in later life. But he lived to just over 3. He is the oldest I've had so far, and was from the worst situation for a good long life! Im not sure why he made it to such an old age while his two brothers died under 18 months old. And all other hairless I've owned beside Lenny have died young. Loved him. He was a weird looking thing, all pink and wrinkly and dumbo-y, with a stump of tail and a huge scar down his back, wobbly back legs and an ever-licking tongue, most people said he was hideous looking but.....nah. He was lovely. I think with weight, to a certain extent (as with humans) absolute body-size and podginess is less important than physical fitness. I like young rats to be lean and athletic, which as they chunk out around 1 tends to turn to being solid but still quite firm and muscly to hold. However, once they get old, like Ziggy, I prefer them to be slightly over rather than underweight, as it does seem to give a safety net against decline (and I've recently halted a decline in my oldest boy by shovelling large amounts of cooked carbs into him twice a day). But it's still an active overweight - I expect climbing, running, bouncing etc - and I'd be worried if they were fat to the point of puddling when they sit! But after 18 months or so I am much happier to see a bit of podge and bingo wing, than skininess. We've had 5 rats (still got three). The two blues (one pet shop [Libby] and one rescue [Rosie]) died at about 18 months. Is there a history of blue rats not doing well at avoiding tumors? Out of the remaining three, two are rescue and the 'sister' of the pet shop rat (our first two, we were naive). The remaining pet shop rat, a bad black, Jemima, had an opp to remove one tumor but had developed 3 since, which are apparently benign so we decided with our vet not to risk the general again. She is currently 31/32 months but has slowed down over the last month, she still get's involved in sorting out the squables of the younger rescues! She's had a good life with a huge living room to free range in, out of her large cage with the others. Must find somewhere to rant about pet shops now . . . I don't know if blues do badly with tumours - certain sorts of blues do have health problems, but tumours are more likely to be general susceptibility to the line as a whole than to a certain colour. Unfortunately, mammary tumours are something of a fact of life if you keep girls - you can minimise the risk by finding a breeder line where they are less common, but they do still happen. 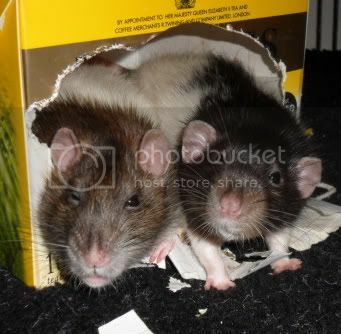 the boys that i've had who are naturally prone to being a little on the chunky side (only a little, i've never had a rat who was heavier than 650g) have had healthier lives. i would rather they have a healthy 18-24 months than have a poorly 24 months. the boys who i've had to fight to keep weight on haven't done so well, i also find that being a little chunky at a year old tends to mean they fair better if they do get ill later on, they have more of a head start because they have more weight to lose and i find they are easier to get back to condition. Rat mum from afar My boys are up in Scotland being doted on paw and claw. Tempest lived until 1 week before her 41st month day. She was just, well, awesome. Three surgeries, one litter, a large lump under her front paw and she was bright as the day i got her. The only reason she was pts was due to a lump on her cheek similar to a zymbals gland tumour and i was NOT letting her go thru that. I don't know about that. I've lost rats at 18 months (and in a couple of cases younger) - but in all cases it was distinct ill health (three tumours, and 2 severe chronic resp disease), not old age. Tbh, I tend to think of 18 month olds as still in their prime, and treat them that way - they seem to thrive on it. As I mentioned before, I consider 24 months to be pretty routine now, and I hope for 30 months - of the last 5 to die, only one was under 30 months (and he was 28 months, and not old in behaviour - but he got liver cancer). The others were 30, 32, 36, and 40 months - the 30 month old had severe resp disease and an inoperable lump, the 32 month old had a heart attack following sudden onset resp disease, the 36 month old was pts after suddenly developing spinal paralysis as a complication on HLD, and the 40 month old's body gave up from sheer old age (although mentally he never quite realised he wasn't permanently 6 months old). Of my last ten to die, only two went at under 24 months (lung cancer, and brain tumour at 18 months and 21 months respectively). I.e. what I'm trying to say is don't worry yourself assuming you'll be losing them at 18-24 months just because you've lost one boy young - young deaths can be as much an anomaly as really old rats . Neotoma wrote: I.e. what I'm trying to say is don't worry yourself assuming you'll be losing them at 18-24 months just because you've lost one boy young - young deaths can be as much an anomaly as really old rats . When would you start giving supplements like senoir aid and a KF diet? I think it is undoubtedly different with every rat. If you have one who seems old and fragile at 18 months, he'll need more special treatment than one who is bouncing happily at 28 months. Fitting the circumstances to the individual is the only sensible way to go. I don't give supplements at all, other than fish oil to anyone who seems to be getting a bit creaky in the joints (and I'd give them if there was a medical need, obviously). I also don't change the base diet much in old age, other than supporting anyone at risk of being fragile with extra cooked food to ensure they have accessible calories. But my diet is quite kidney friendly anyway - there isn't any animal protein in my dry mix, so that doesn't have to be changed or cut down (I do feed animal protein, but I do it fresh, partly for quality, and partly so I can fit the type and the amount to the needs of each rat), and my diet contains a large proportion of fresh food. I do change the amounts of dry vs cooked grain with older or fragile rats, but again, there isn't a set age. I generally feel that it's best to feed a suitable, but fairly kidney friendly diet throughout adulthood to reduce the risk of problems being made worse unseen, then it is to feed something non-KF, and then suddenly change at an arbitrary age. My Himilayan Marylin will be 3 on December 29th of this year, she has had one tumor removed at in February of this year. She is still doing very well. My hairless boys will be 3 years old in November and their just as active as my 7month old girls. Ive never had any health issues with either of the hairless boys. My Cinnamon Hooded boy will be 3 in February of next year.